The researchers, who come from MIPT, the Institute of Microelectronics and High Purity Materials of the Russian Academy of Sciences, and Royal Holloway, University of London, described the new device in Nano Letters. The detector consists of two superconducting aluminum loops coupled by Josephson junctions. A phase difference between the wave functions on loop segments causes the critical current in the device to change from zero to maximum and back to zero in a steplike manner with the change of the quantum numbers in each of the loops. The two loops are placed one on top of the other on a flat chip. Importantly, they are coupled by Josephson junctions. The notion of a wave function refers to a way of describing quantum objects, including individual particles and more complex systems. A wave function assigns a value called probability amplitude to all points in space. The terms "wave" and "amplitude" imply that the objects described by wave functions behave much like waves. In fact, it is even possible to talk about the phase of a wave function. In quantum mechanics, the wave function is a central concept and the primary characteristic of an object. A Josephson junction is a device made of two superconductors separated by a 1-2 nanometer layer of dielectric material. Vladimir Gurtovoi, a senior research scientist at MIPT's Laboratory of Artificial Quantum Systems and one of the authors of the paper, commented on the results: "Our technology is remarkably simple: We use a material that is quite typical for superconductivity research and standard fabrication techniques such as electron-beam lithography and high vacuum deposition of aluminum. However, the end result is a system that has not been studied before." 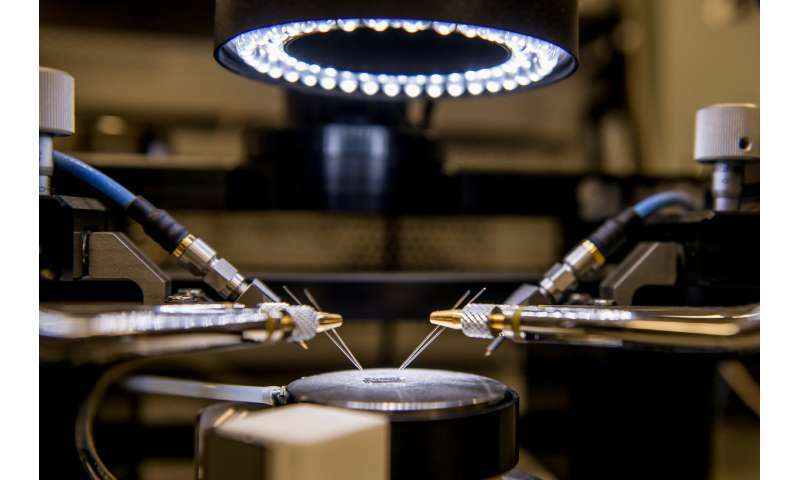 The researchers cooled the device down to 0.6 kelvins, below the temperature of the superconducting transition of aluminum, and applied a bias current. In a variable magnetic field, the physicists observed periodic voltage jumps corresponding to the changes in the quantum states of the superconducting loops of the detector. The voltage oscillates with the period corresponding to the flux quantum penetrating the detector. A flux quantum is the minimum amount by which a magnetic flux threading a superconducting contour can change. The experimental setup is a variation on the traditional superconducting quantum interference device, or SQUID. However, the authors employed an unconventional geometrical configuration of superconductors. By conducting a theoretical analysis of the operation of the device, the researchers showed (see the appendix) that the superconducting current through the two Josephson junctions in the new interferometer is equal to the sum of the individual currents through each of the junctions with some phase corrections, which lead to voltage jumps occurring when the quantum numbers associated with the states of the two loops change. Notably, detector response is determined by the quantum numbers. The new device is therefore a perfect quantum state detector. "The new configuration improves substantially on the sensitivity of the conventional SQUID. As a result, the scope of possible weak magnetic field measurements is greater," explains Vladimir Gurtovoi. Coherent superconducting systems are now intensively investigated. Among other things, they could be used as qubits—the basic units of information processed by a quantum computer. The qubit is a quantum analog of the classical bit: While a regular bit stores data as zeros and ones, a quantum bit can be in a superposition of two states—that is, both zero and one at the same time. Although this will not allow quantum computers to surpass their classical counterparts in all operations, they probably could be extremely effective in a number of special cases. These include quantum system modeling, decryption, and database search. 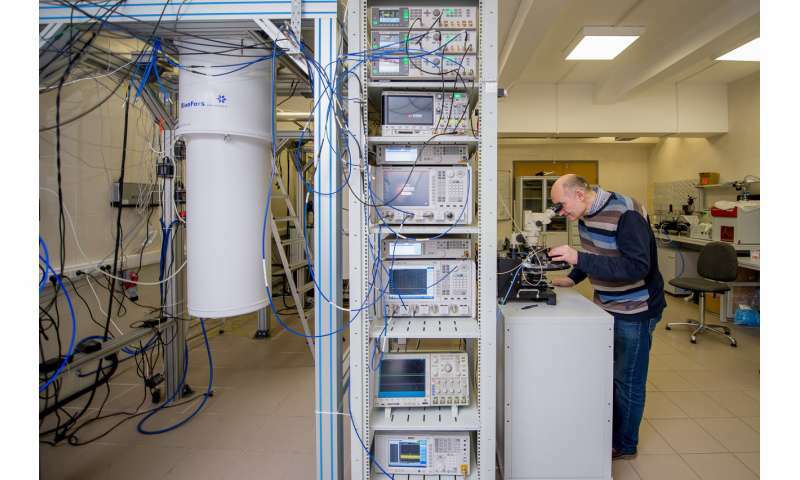 MIPT's Laboratory of Artificial Quantum Systems is part of the ongoing global effort to develop quantum computing technology, including qubit design. The double-contour interferometer with one of the loops replaced with a qubit may be used to direct the detection of qubit quantum states. The Ia and Ib in this expression are the critical currents for each of the two Josephson junctions. The change in the phase of the wave function on each of the junctions, which is determined by the geometry of the new interferometer and is the same for both junctions, is denoted by ϕa. The phase term π(nu + nd) includes the angular momentum quantum numbers nu and nd for the top ("up") and bottom ("down") loop, respectively. Because the parity of the quantum number sum nu + nd changes when one of the two numbers changes by 1, the second term in the equation changes its sign in a steplike manner. Since the Josephson junctions may be considered identical, Ia is equal to Ib, the whole expression ultimately produces two discrete values for the critical current: It either amounts to Ia + Ib or—when the two terms are opposite—equals zero. If the quantum number sum is even, the voltage across the interferometer is zero. In the case of an uneven sum, a known and easily measurable voltage will be detected. What's the noise eating quantum bits?